You are invited to join us on a 12-day spiritual pilgrimage in England! Learn about the inspiring lives the St. Thomas Becket, St. Thomas More, other Elizabethan martyrs and the builders of the great monasteries. We also will visit the Tower of London, join in choral evensong, and enjoy an evening in the theatre. In addition to London and Canterbury, we will travel north to explore the ancient sites of Holy Island, Lindisfarne, Hexham, and the great cathedrals of Durham, Helmsley, and York with specially planned prayer services and liturgies throughout the journey. Pilgrims will arrive on their own and check into the Fielding Hotel, which is in a superb location in London’s vibrant Covent Garden. After time to rest, we have a welcome dinner at a local restaurant. Travellers on their own will check in at the hotel after 2 PM. After breakfast at a local cafe, we journey to the Tower of London to the West gate and be escorted by a yeoman warder to the Bell Tower. We visit the cell of St Thomas More and nearby we will celebrate the liturgy. The group will be escorted from the cell to the Upper Bell via Elizabeth’s walk for a short talk on St John Fisher. After some free time at the Tower, we will board our coach to have lunch at a local pub. Afterwards, we take a panoramic coach tour of the city, which shows us St. Paul’s Cathedral, with a drive along the Thames embankment, with views of London, Southwark, Big Ben and the Houses of Parliament, Buckingham Palace, Kensington and Harrod’s Department store. We return to Westminster Abbey for a visit and Evensong at 5 PM with the evening free to explore the city or see a West End show. We travel by coach to Canterbury, where we visit the St Dunstan’s Church up the hill from the Cathedral where More’s head is kept as part of an ecumenical shrine. Then to the Cathedral for a tour and to celebrate the liturgy in the Cathedral. We remember St Thomas Becket, the Archbishop of Canterbury from 1162 until his murder in 1170. Four knights, believing the king wanted Becket out of the way, murdered him in Canterbury Cathedral. He was made a saint in 1173, and the Cathedral has become an important focus for pilgrimage. After visiting the Cathedral we have lunch with free time to explore this wonderful city before returning to London for an evening at leisure. After an early breakfast, we transfer to the convent at Tyburn, the scene of many executions of Catholic martyrs, with a special tour of the Martyrs’ Exhibition by one of the nuns of the cloistered Benedictine community. We remember the martyrs as we celebrate the liturgy here. At 11 AM our coach takes us to the landing stage at the Embankment, where we board our boat for a classic cruise to Greenwich and back, during which we enjoy a three-course lunch. On return to the embankment, we will be on our own for dinner and to explore the city. We transfer by van from the hotel for the morning train from London Kings Cross, with the opportunity to have lunch on the train, arriving in Newcastle in the early afternoon. Our coach takes us to our hotel, the White Swan, in Alnwick, Northumbria, for a two-night stay with dinner at the hotel. After breakfast, we drive over the causeway to Holy Island, when the tide is out, to visit the Lindisfarne Priory, founded by St. Aidan in 635, but destroyed by the Danes in the ninth century. It was not until the 11th century that it was rebuilt by the Benedictines of Durham, later falling into ruin again after the Dissolution of the Monasteries in 1535. Stones from the Priory were used in the construction of Lindisfarne Castle, built in 1549 as protection against Scottish raids. It too fell into ruin and was restored in 1900 by Sir Edwin Lutyens, the designer of the Cenotaph in Whitehall. We celebrate the liturgy on the island, with free time and lunch on own. We stop at Seahouses for a walk along the seashore and possibly tea before returning to Alnwick with dinner at the hotel. After breakfast, the coach takes us to Hexham, originally named Hagultald, from a neighbouring stream, the Hagult. St. Winifred’s greatest achievement was building a monastery here between 672 and 678. The church was reputed to be the finest north of the Alps. Largely destroyed by the Danes in 810, Winifred’s tiny crypt remains where one can see the building materials used that date from the Roman occupation. We celebrate the liturgy and continue to Hexham Abbey for a tour. After a light lunch, we continue to the great Cathedral City of Durham and check into the King’s Lodge Inn with dinner at the hotel. After breakfast, we visit the Cathedral of Durham. 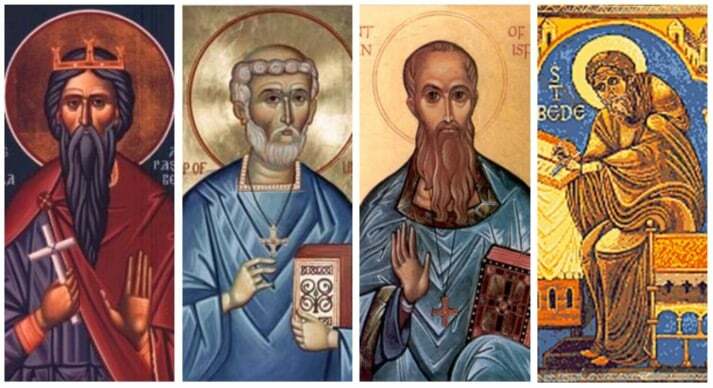 With the ravages of the Danes in the 9th century, the monks, with the head of St Oswald and the body of St Cuthbert, wandered for seven years before settling at Chester-le-Street. When miraculous signs were given to St Cuthbert’s body, it was later moved to Durham. A stone chapel was built over the tomb and Bishop Aldhon began a great church on an eminence at a bend in the River Wear. This building was later replaced by a Norman cathedral dedicated to Christ and the Blessed Virgin Mary. In 1104 the shrine of St Cuthbert was transferred to the new cathedral and now lies in a refectory behind the high altar. His stole, maniple and pectoral cross can be seen in the cathedral library. The Venerable Bede’s shrine was destroyed at the Reformation, but his tomb can still be seen in the Galilee chapel. We have a guided tour of the Cathedral and celebrate Mass followed by lunch. Afterwards, we travel by train to York where we check into Hotel 53 in York and enjoy free time with dinner on our own. After breakfast, we celebrate morning mass at the Chapel of St Margaret Clitherow, the Pearl of York, one of the forty martyrs of England and Wales. We walk through the Shambles and continue to York Minster with a guided tour to hear the history of Christianity in the North of England. The afternoon is at leisure to explore the area, especially the Jorvick Viking Centre, which holds excavated houses and objects, from the eleven-hundreds. In the evening we celebrate the conclusion of our pilgrimage with a festive Yorkshire dinner. After breakfast, we celebrate the farewell Mass at the Bar Convent and visit the Museum with a guided tour by Sr. Agatha as well as free time to enjoy the city before our return transfer by train to London Kings Cross with an overnight stay at a nearby hotel. Breakfast in our hotel before our own onward travel. Registration is now open. Book online now. Meal plan: 10 breakfasts, 3 lunches and 5 dinners. Guided tours per the itinerary. Local coach transport as per the itinerary. Financial protection under our ABTA bond. Single room supplement at $850 per person (limited availability). Lunches and dinners not listed in the itinerary. Entrance fees not listed in the itinerary. Gratuities for the hotel staff and the coach drivers. Balance payment due by 5th April 2018.